More and more we use technology to do everything, but it seems like there is also a counter culture within this who are obsessed with doing things themselves. DIY (aka Do-It-Yourself) culture has become a whole new market, people are falling in love with the kitschy appeal of things that come in kits rather than pre-made products. When everything is so easily available at the click of a button nowadays, the thrill of shopping has started to wane on some people (If I’m being real here, I do still love shopping though). Do-It-Yourself culture is all about going on craft journeys and seeing what you can make. With the world at our fingertips we’re able to connect with millions of other people sharing cool and creative ways to spend your days. So even if you can’t come up with something yourself, you’re sure to find something neat to create in the blogosphere. 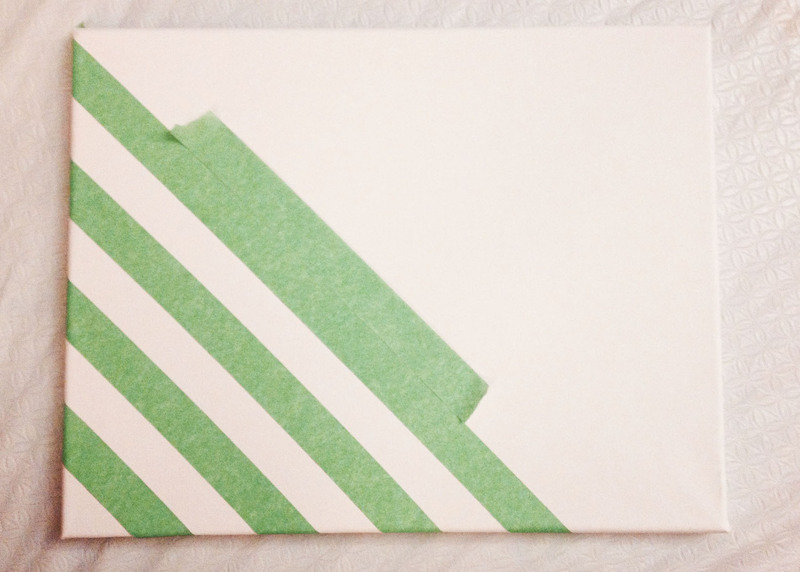 DIYs are about the sense of accomplishment you get when you complete your latest project. Rather than a house filled with products that you bought, you get a home rich with the memories of everything that you created. Yes, DIY projects take more time and work, but they create unique opportunities to hangout and have fun with your friends and fam rather than just sitting in front of the tube together. That is what I’m hoping you will get out of the DIYs I share. I love love love gallery walls, but they are always so expensive to make. I also wanted to do a combination of frames prints with painted and hand made art, and decided to start with painting canvas. A huge inspiration for my DIY projects comes from the amazing blog A Beautiful Mess, so if you’re ever looking for more fun projects they have like a bazillion. 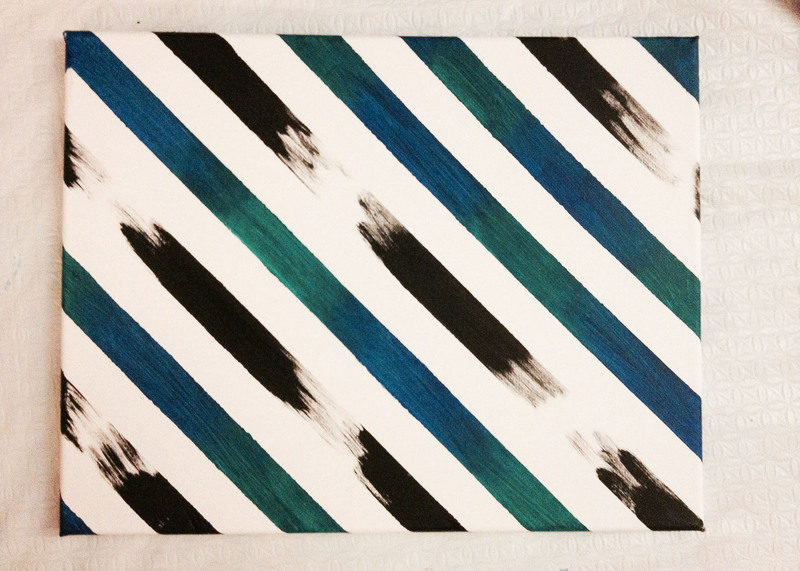 So I’m gonna show you how I created some pretty sweet looking canvas paintings for less than $5 each!! Plastic Sheet (you’ll need this to put over your workspace so that you don’t get paint on anything you wouldn’t want it on. Garbage bags and newspaper also works fine. Now you’re ready to go! Also make sure you’re wearing old clothes or that you don’t care if you get paint on whatever you’re wearing because it gets messy. 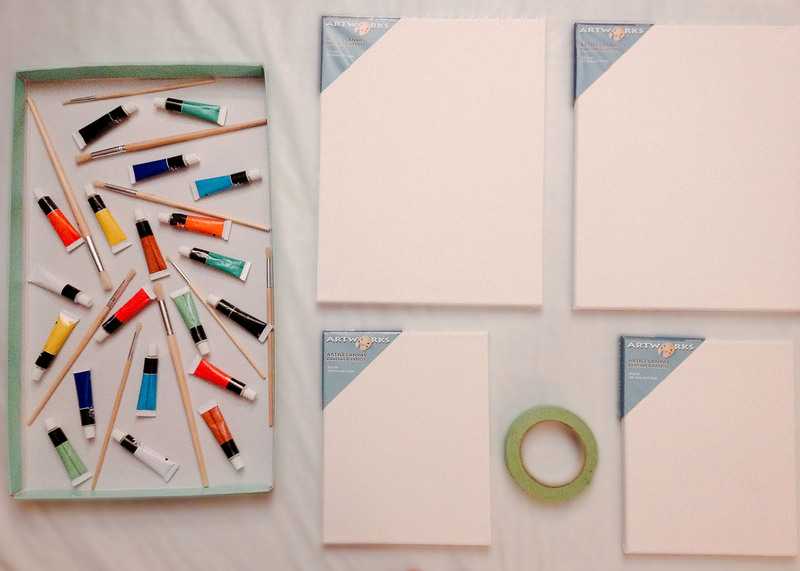 I’ll show you a tutorial for how to make beautifully lined canvas art for you gallery wall. Step 1: To make sure that all your lines are evenly spaced use an extra piece of tape to measure the equal distance in between tape (as shown below). Step 2: Once all your tape is secured paint your stripes whatever the heck colour you want :). 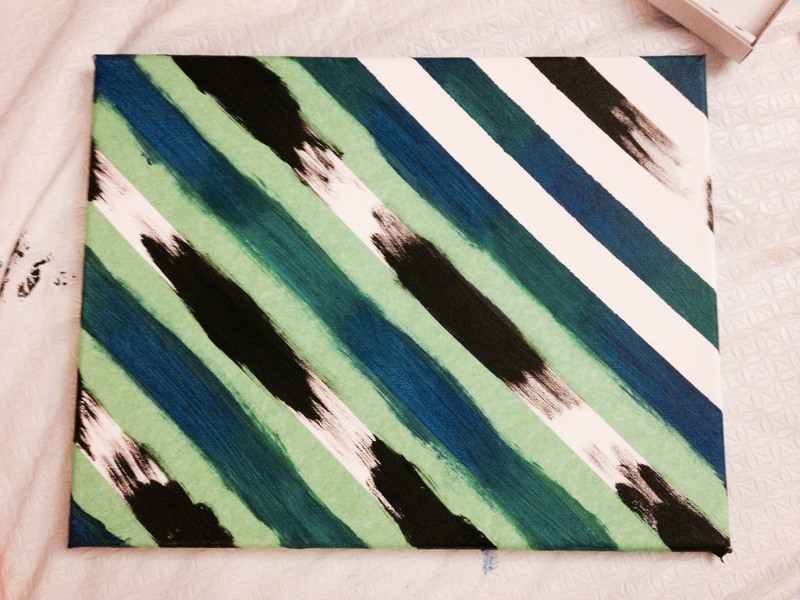 I layered green and dark blue paint in half the stripes and then shaded out black paint in the other half of the stripes. Don’t be afraid to paint on top of the tape, that’s what it’s there for! Step 3: Pull of the tape while the paint is still wet, this way the tape comes off easier and creates cleaner lines. Step 4: Make sure to leave the painting to dry before you try to hang it anywhere ( we don’t want paint all over your wall). And Voila! If you want another example of a way you can use tape to create cool lines. 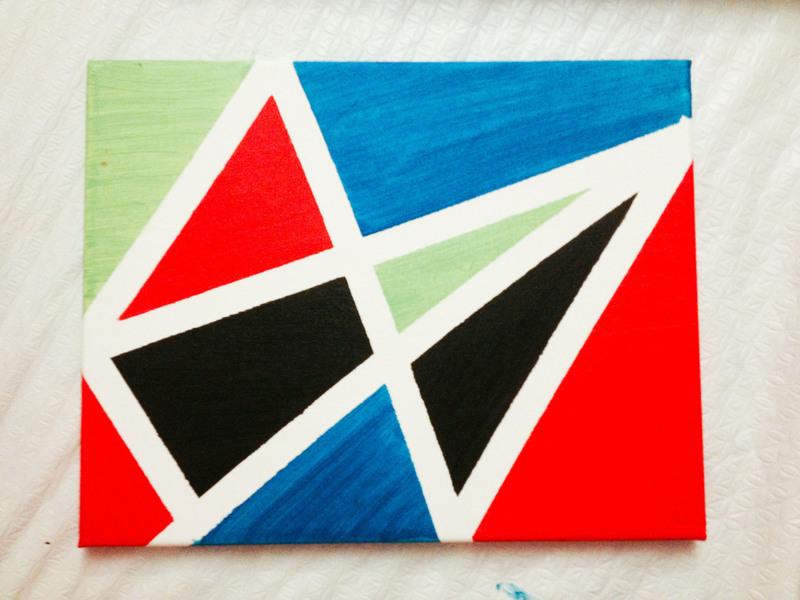 For my second painting I used scotch tape to create thinner lines and a more abstract shape. You can find tons of other cool ideas using tape to create shapes and lots of other objects to use when painting on Pinterest.